Last weekend I was able to take a "beginner machine quilting" class. I mainly signed up just to get some practice. I figured I wouldn't learn much since "I know quite a bit about quilting." For $25 I thought that maybe the teacher could help me figure out the tension on my Kenmore 19233 for free motion quilting. 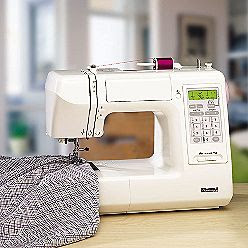 You see, I have owned my Kenmore (made by Janome) for about 4-5 years, and have gotten it to work perfectly for everyday sewing. But when it came to free motion quilting, I could never get the tension just right. I would always get loops from the top thread on the back side of the quilt. Well when I was at the quilting class the teacher tried to help me but no adjustment would help. Finally she called the quilt shop owner who is pretty dang savvy when it comes to all different types of machines. Well after about 3 minutes she figured out I wasn't threading my machine correctly! Go figure! After 5 years of owning my machine I've been doing it wrong the whole time! See the little green arrow? (feel free to click to enlarge) I have always missed looping the thread around that little hook there. ...and this is the way it's supposed to thread! But it doesn't end there. When I got home I decided to clean and oil my machine (now this particular machine does not have any oiling instructions - it claims to not need oil) Well I know enough about mechanical things to figure out where a little oil could be useful especially if the machine is getting loud and clunky sounding -like mine was. Well after it was all cleaned (and after a run in between my poor finger and the shuttle hook race - I'll spare you the gory details) I made up a practice quilt sandwich. To my horror and surprise the loops were back. I spent the next 1/2 hour trying to figure out the tension all over again. Adjusting the top thread tension only got me so far. Close to perfect but not good enough. I checked my manual for instructions on how to adjust the bobbin tension and found no instructions whatsoever. You see my machine is a top loading bobbin machine. And I guess they just think that information is not applicable for some weird reason. So I took my machine apart once more and guess what I discovered? My bobbin adjustment screw!!! See that little screw front and center in the above pic? On the black plastic? That's it. I had never noticed it before. The only reason I even know what it is, is from my old sewing machine that had a regular vertical bobbin thinga-ma-jiggy. Anyway if you rotate that little screw to the left it loosens the bobbin tension, go the other way and it tightens the bobbin tension. Lefty loosey righty tighty. One other thing I was doing wrong, I was using metal bobbins that fit... but I realized that they created too much drag. So I switched to some plastic ones and the drag was virtually gone! Yay! so now my machine free motions awesomely. I was able to do the quilting on my DQS6 quilt in one evening and the best part is: No Loops! Thread machine correctly, oh and use a cone holder thingy if you are using a cone of thread. Unplug the foot pedal when cleaning machine so as not to accidentally tap it. So what did you end up having your upper tension on in the end? I think I use mine on 7 or 8. I don't have loops but sometimes I go around too fast and get the looong stitches. I am getting better though! Officially.. I am over the top excited about this post.. and the headband one from above too.. but I had to leave a comment on this one. There is a beginner quilting class at my LQS and I have not made the time to take it.. well those days are OVER! I am going to head over there today and sign up! I know my machine can do free motion quilting but I have not been able to figure it out. I love the possibilities that are open with that type of sewing but figured it took a massive expensive machine to make it happen. So THANKS for this post. You really made my day! Thank you so much for this posting. 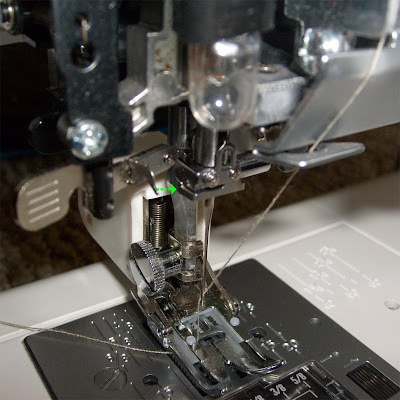 I own a Janome MC4800 for several years now and been so "nutz" because the manual never says how to adjust the tension in the bobbin. I have search the web without any help until this morning! OMG you are my hero. Now I can do free-motion quilting without constantly picking the stitches out. Thanks a zillion! I FMQ on my Janome DC 2010 - never in my life did I know I was supposed to thread my thread around that hook thingy - I have a hook that looks JUST like yours. . . as a matter of fact my Janome looks very similar to yours altogether. 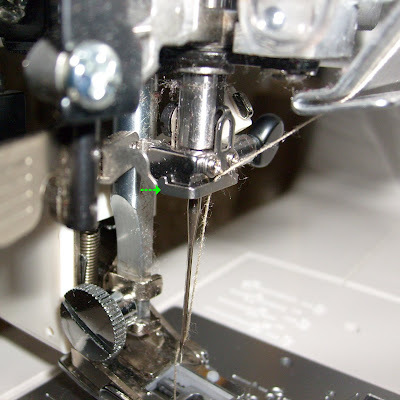 When using invisifil or a thinner thread in the bobbin I usually have no problems with the tension. . but when I use a thicker thread like thread from Connecting threads in the bobbin, I do sometimes get a bit of tension issues. . I keep my top tension at usually a 4 when quilting. I wonder how it will GO if I thread it around that HOOOK ! WOW!